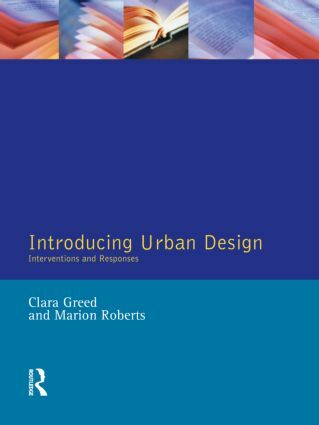 Introducing Urban Design: Interventions and Responses is a new departure in the town planning series under the editorship of Clara Greed. The dynamic new subject and profession of urban design straddles the fields of town planning, architecture, landscape architecture and transport planning. This book recognises that a key feature of modern urban design practice is the ability to integrate a concern with the visual and aesthetic aspects of urban form, with a strong social awareness of the need of user groups, plus a sensitivity to wider environmental and sustainability issues. In this it continues the themes already introduced in earlier volumes, such as the changing nature of the profession, social problems and the means of implementing policy. Written by a team of eminent urban designers, architects and planners under the joint editorship of Clara Greed and Marion Roberts, the book introduces the reader to the subject through a discussion of current issues, approaches and user responses. Introducing Urban Design: Interventions and Responses is an ideal resource for undergraduate courses in town planning, architecture, landscape architecture, estate management and housing studies. It is also suitable as an introductory text for first year diploma and masters programmes in urban design and suitable for RTPI, RICS, CIOH, CIOB, ASI, ISVA and RIBA courses and will be of interest to professional practioners in the urban design field.